Valkyrie Island is a region in the Palace District in northern Irukandji. It lies northeast of Hephaistion (later Boyfriend Beach), north of Valkyrie Shoals, and east of Arms of Patroklos (later Palace Lagoon). 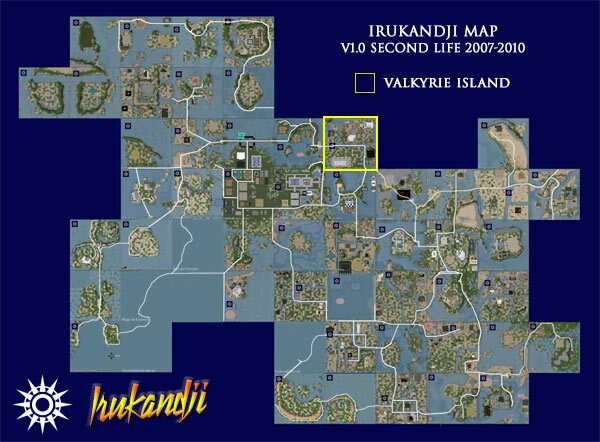 Valkyrie Island was a significant sim during Irukandji's time on the Second Life grid, and is one of the few major inner islands that did not re-eventuate on the InWorldz virtual world. This was purely due to the lower population in IW and subsequently less demand for so much land. With two picturesque bays and a gently sloping landscape with the Odin River running through, Valkyrie Island is a pleasant sim with a sense of light suburbia. One or two larger landowners have residences on Valkyrie Island but the majority of the blocks were small. 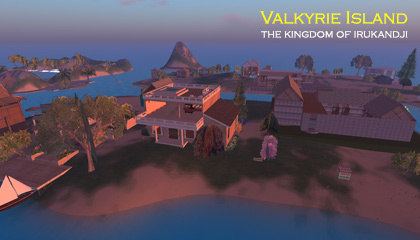 At its peak, Valkyrie Island was home to around thirty residents, and its close proximity to the facilities on Hephaistion made it a popular place to live. The name 'Valkyrie Island', and similarly its neighbour, Valkyrie Shoals and the Odin River, are a nod to Norse mythology, which in turn is grounded in Ragnarok Crater on the nearby Baie de l'Amore sim. The back story behind the symbolism is too complex to dissect on this page, but I may add the info to the Baie de l'Amore page at some future point.